* ***For international tours, validpassport (valid for 6 month after the return date) and valid visas arerequired. CompassHolidays Bus Tour accepts no liability forcustoms delay. Morning Departure from Toronto to the well-known Big Apple - New York City, We would stop along the way for lunch in Pennsylvania. Approximate arrive in New York is around 4:00 in the afternoon, and start our exploring tour from taking a one-hour boat cruise down the East River, and back up from Hudson River. 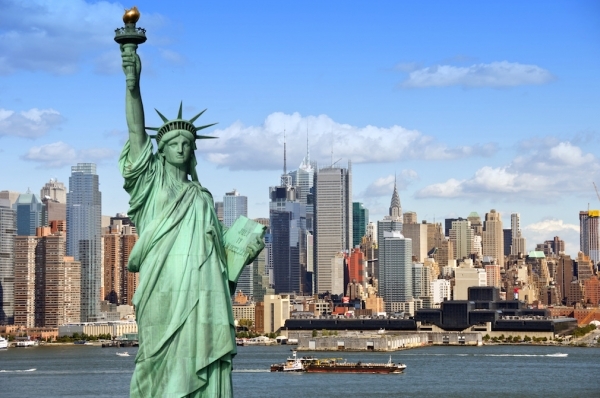 The ride gives you the best view of Manhattan, some of the most iconic landmarks of New York City, where you can explore the majestic Statue of Liberty, Ellis Island, the historic immigration center.Along the way, we will pass by such as the Brooklyn Bridge, the Statue of Liberty, etc. Then a walking tour through the Wall Street and Ground Zero – the site of 911. After Dinner, head to the hotel in New Jersey. Leaving the hotel in the morning and arriving at America's largest city - "Big Apple”, New York City. We will go to World Trade Center Freedom Tower, from where you will see an incredible city skyline. Taking the elevator to the top of the tallest building in the Western Hemisphere, on levels 100, 101, and 102 of the 1,776 foot tall One World Trade Center building. One World Observatory provides unique, panoramic views of New York City, its most iconic sites, and surrounding waters. You will also be able to see other famous building and landmarks in New York City such as the Empire State Building, the Chrysler Building, the Rockefeller Center and many more. We then visit the 911 Memorial and the Financial District of not just New York but the world. Next, we will visit The Intrepid Sea, Air & Space Museum (Fee applied), Where can experience the legendary aircraft carrier Intrepid, the first space shuttle Enterprise, a Cold War-era submarine Growler, and the world's fastest jets. After that, start our visit by the famous Times Square, visit the famous Wax Museum Madame Tussaud and Museum Ripley's Believe it or not, or free time to stroll round for shopping and diner. Around 8:00pm, go back to Hotel. After breakfast, leave for Premium Outlets, where you will find the items from all the famous brands at very favorable price in the Mall.After lunch, leave for Toronto and stop at the duty free store (American side).Pass the border back to Canada and we will arrive in the Toronto around 9:00 pm. Tour fare exclude: meals, admissions, gratuities (USD$14 per day/person, same applied to adult and child), and all personal expenses.